Totteridge is an old English village, and a mixture of suburban development and open land, situated 8 miles north north-west of Charing Cross. This area was called Tataridge in the 13th Century. It may have been named after someone called Tata. The ridge is the high ground between the valleys of the Dollis Brook and Folly Brook. Over the centuries the rural qualities of Totteridge have attracted well-to-do families. Cardinal Manning was born at Copped Hall in Totteridge in 1808. With the opening of the Great Northern Railway station in 1872, late-Victorian and Edwardian mansions were built around the old village. In line with overall trends in the late 1930s, following the conversion of the railway station (in operation from 1872 until 1941) into a London Underground station (from 1940) on the Northern line, smaller properties were built within walking distance of the station (Totteridge and Whetstone tube station). In 1968 much of Totteridge was designated a Conservation Area, and no major developments have taken place since then. Totteridge was a civil parish of Hertfordshire covering an area of 1,604 acres and formed part of a thin protrusion into Middlesex. 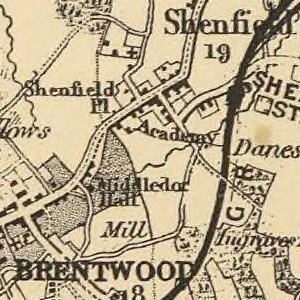 It became part of Barnet Rural District and had a parish council from 1894 to 1914. It then formed part of Barnet Urban District from 1914 to 1965. 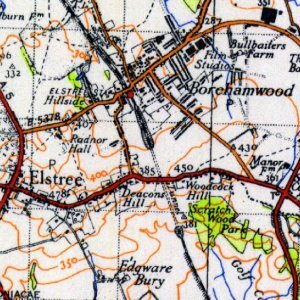 In 1965, the parish and urban district were abolished by the London Government Act 1963 and the area was transferred from Hertfordshire to Greater London, to become part of the London Borough of Barnet. In 1901 the parish had a population of 844 and by 1951 it had risen to 4500.